So, who has a better track record at keeping promises? 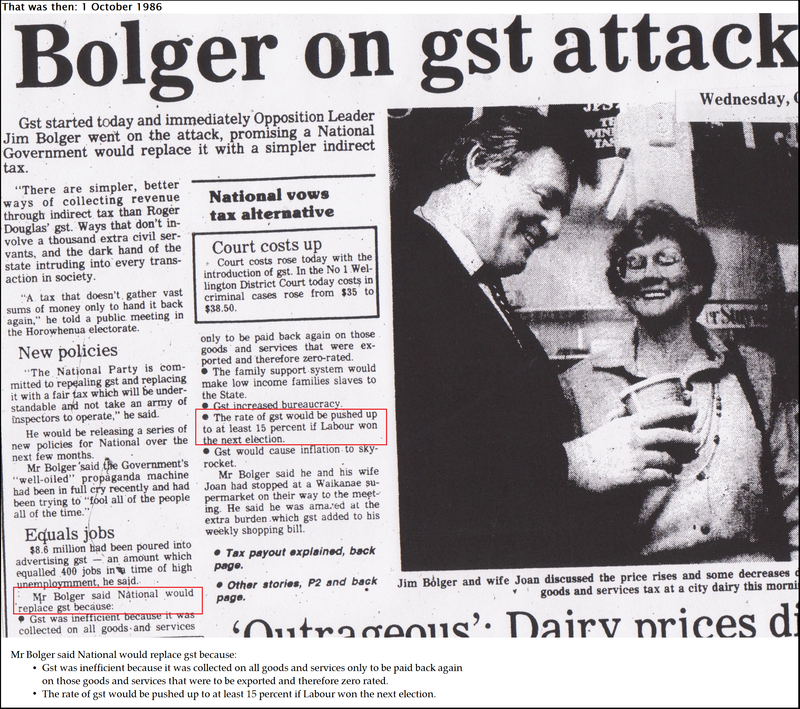 * Gst was raised to 12.5% in 1989. This blogpost was first published on The Daily Blog on 25 February 2014. 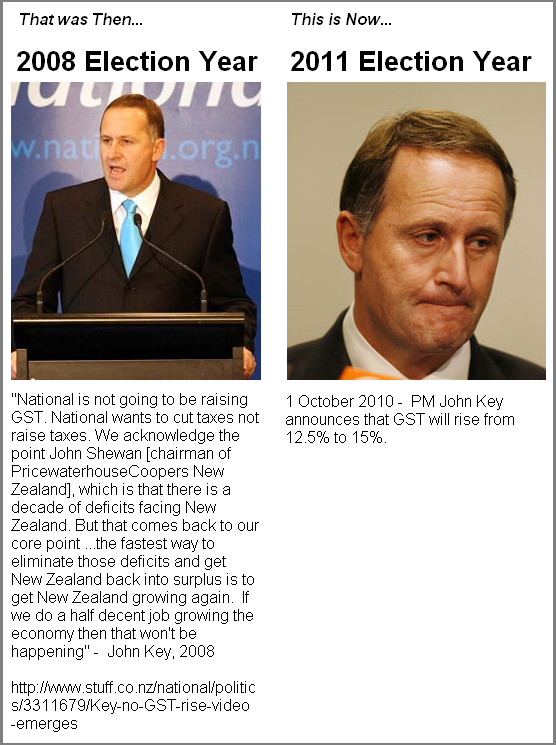 Sure enough, in April 2009 and October 2010, National cut taxes. Except… it was jiggery-pokery, and with a sleight-of-hand trick, National recouped much of the tax cuts by raising taxes elsewhere. 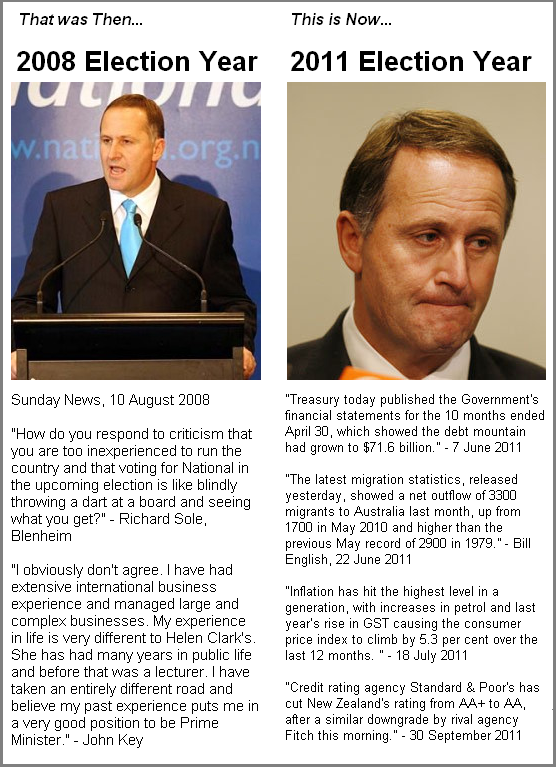 National pretends to be the Party of low taxes. It is not. 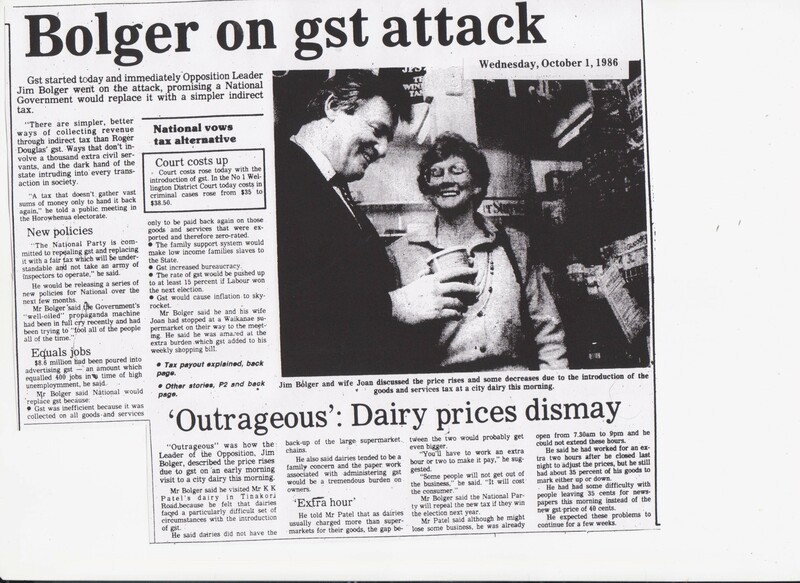 National won an election in 2008 on promises of low taxation. It lied. National’s tax cuts benefit the top 1% whilst increases in other covert-taxation has less impact on them. This is true. What other taxes will be quietly increased? When Labour, The Greens, and Mana promise a new tax – eg; Capital Gains Tax – at least you know what you’re voting for. 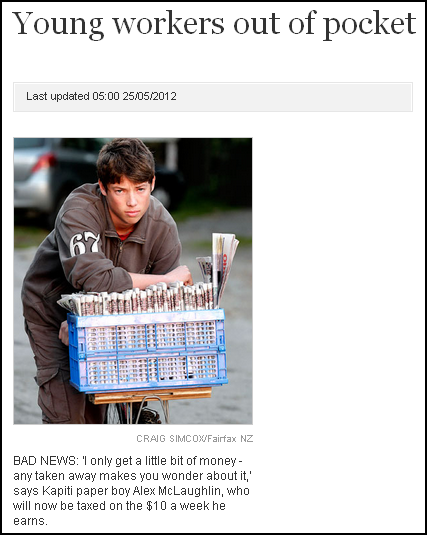 On a scale of 1 to 10 – one being the most world-wise and street wise person on the planet, and 10 being that you hold shares in the Wellington Harbour Bridge – how gullible are National voters? Just something to remember next time you’re filling up your car. Many of you have told me that you are worried about the increasing cost of living. That’s why the tax changes are so important. It is a common theme amongst the New Right and neo-liberal dogma that cutting taxes equates to more jobs. The idea is that with more money in people’s pockets; they spend more; consumption rises; industry has to produce more; and subsequently hires more staff. And even if people do spend more, there is no guarantee that businesses will hire more staff. Much of our consumer goods now originates from overseas, and what we spend here in NZ probably has little effect with overseas manufacturers. Even locally, there is certainly no guarantee that an extra $15 or $20 in taxcuts will result in more jobs. 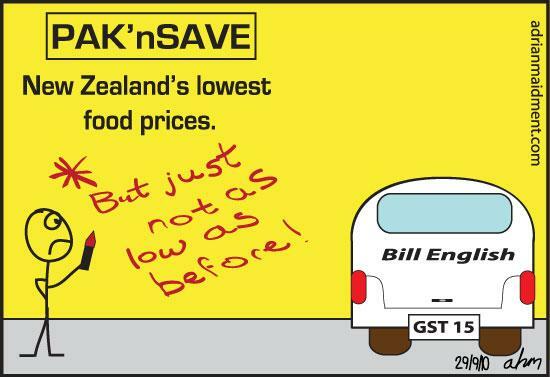 Especially when gst, fuel, electricity, and government charges have risen to eat up tax cuts for low and medium paid workers. ” New Zealand finance bosses are feeling good about the economic recovery, but research shows that optimism doesn’t extend to hiring new staff. Global finance and accounting firm Robert Half’s survey of 200 chief financial officers and finance directors found 79 per cent were confident about the prospects of national growth in 2012. Those who thought their own company would pick up speed in the year ahead made up an even higher proportion, at 87 per cent. 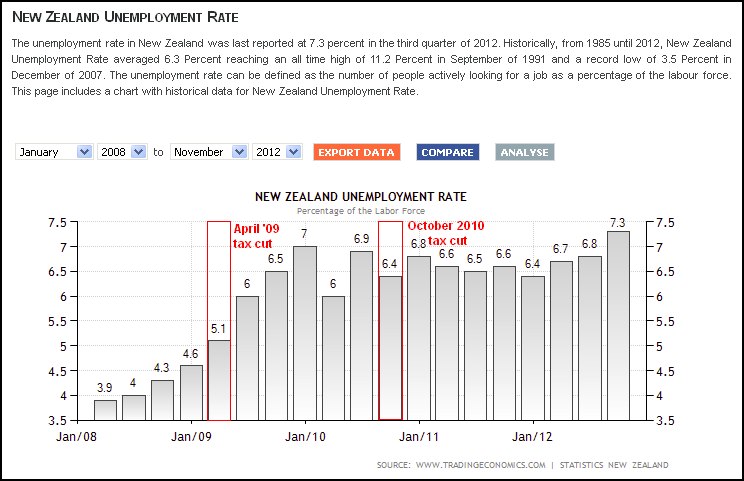 So John Key’s hopelessly optimistic vision of “boosting growth to create jobs” has become a distant dream, based on -? Naive faith in a discredited “free market” dogma? Helping out his rich mates? A misguided belief that creating jobs could be easily done at the stroke of a pen? Free Market fairies and Employment angels?! The graph above vividly illustrates the fallacy linking tax cuts to job creation. Indeed, after two taxcuts, this country has little to show for it except slashed state services; thousands of state sector workers sacked; and having to borrow billions more from overseas to make up for the shortfall in the tax-take. The closure of two schools for disabled children, Salisbury Residential School in Nelson and McKenzie Residential School in Christchurch, is perhaps the most tragic face of National’s harsh policies. When we cut taxes, we cut essential state services, there is no other option. National supporters and low-information voters may hold cherished beliefs that cutting taxes are a good thing – until they themselves, or a family member, requires a state service that has been wound back, or eliminated altogether. Oh goodness, Dear Leader. “Surprised”, were we? How can he have been surprised when unemployment has been rising since January, when it was at 6.4%?! Was he not paying attention – much like his briefing at GCSB offices when Kim Dotcom’s arrest was discussed? 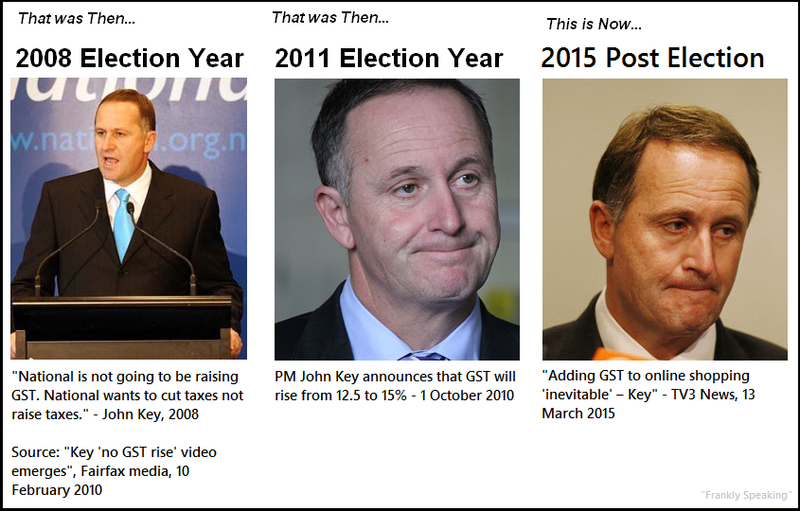 Mr Key really needs to bring his mind back from the golf courses of Planet Key. Key is happy to throw tax breaks at the highest income earners in this country – but thinks that tax breaks for preserving jobs “wouldn’t be in New Zealand’s best interests“?!?! 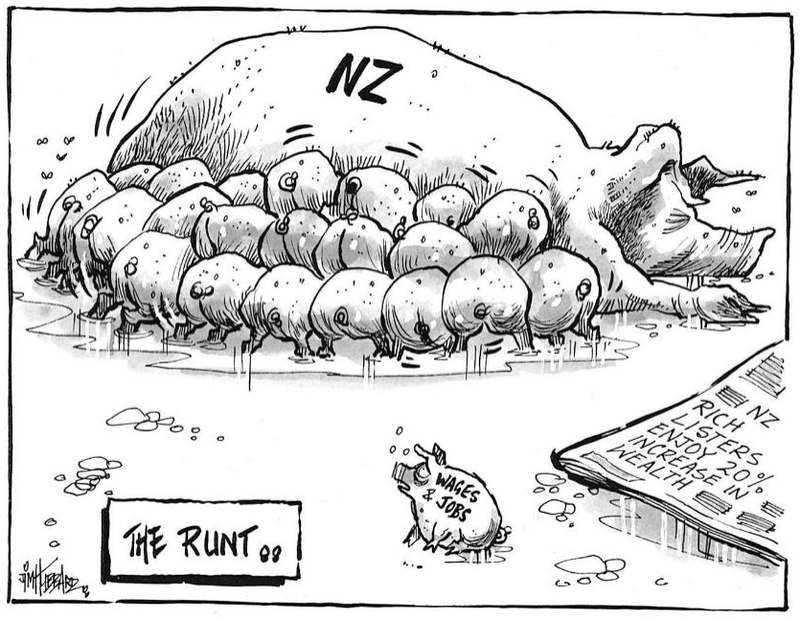 And let’s not forget the generous tax breaks he gave to Warner Bros – a multi-billion dollar corporation – as a ‘sweetener’ to keep “The Hobbit” in New Zealand (when there was in reality no risk of production going overseas, according to Peter Jackson). This man may have been raised in a state house, by a solo-mum, but it appears that he has lost all perspective. His fitness to be Prime Minister has to be seriously questioned. “The number of unemployed people increased 6.1 per cent to 160,000 but the labour force participation rate also rose, by 0.6 points to 68.8 per cent. 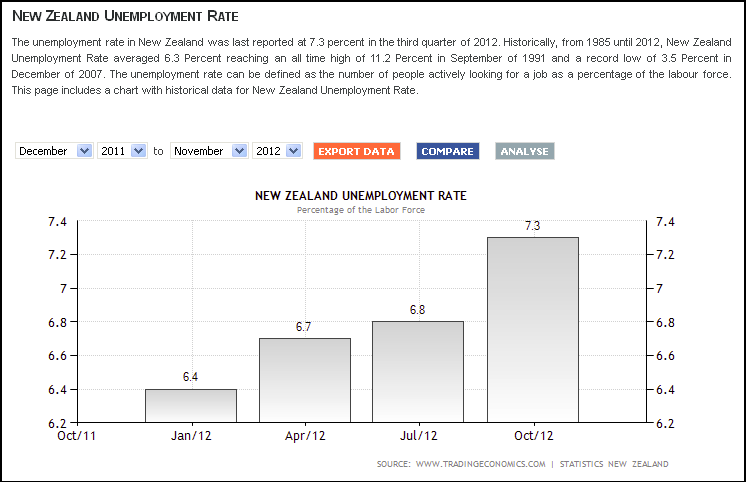 Key said the unemployment rate was “a very weird one at the moment”. Only John Key could be so utterly disingenuous as to laud rising unemployment as ” New Zealanders are more confident the economy “. TV3: Opinion – Is our economy collapsing?